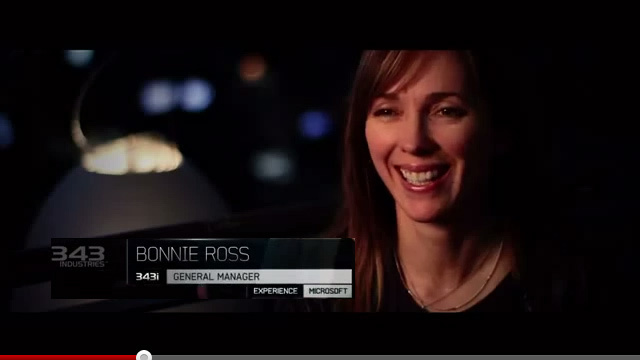 Here's a nice write up by Bonnie Ross who has been very heavily involved in the development of 343 Industries into a studio capable of delivering Halo 4. Jessica asked me to write a section about us hitting gold last week. When we all celebrated last Thursday night, there was joy, relief, and pride. There was celebratory drinking, and champagne was poured on people’s heads, but mainly there was a lot of reminiscing about the path we took over the last few years. So I figured I’d write about that journey to the gold (disc) at the end of the Halo 4 rainbow. Along that journey, it is easy to be critical, even overly critical of every move and every mistake. When you get to the end, something washes over you (could be champagne over the head from a fellow 343er, Josh) that makes you look back at the journey with a little more forgiveness, Vaseline on the lens, maybe even a little regret that this part of our journey is over. Year of the Forerunner: In 2008, we weren’t working on Halo 4 yet because Bungie was working on ODST and Reach. So as a small 343 team, we had the luxury of a year to just think about the universe and the technology. Where did we want to go next? We had controversial discussions about the Forerunners and their origins. Should they always be a mystery or should we open up that Pandora’s Box? As you already know, we opened that box and Frank and the team set to help define the future fiction, the Forerunner backstory and characters that would ultimately become the Prometheans, the Didact and other inhabitants of Halo 4. While we weren’t thinking about the exact Halo 4 story back then, we were working on high-level themes for Halo 4 and the overall saga. We were thinking about Chief and Cortana, and we were thinking about new enemies and new threats, specifically Forerunner in nature. We chose the acclaimed science fiction novelist Greg Bear to write a trilogy dealing with elements of that story. As Greg’s first novel in that trilogy came out in 2010, he had a lot of questions before we had answers: what did the Prometheans look like? What did the living, breathing Forerunner civilization feel like? So between 2008 and 2010 our artists, designers, and writers met repeatedly with Bear to give him character sketches, talk about physics, shapes and characters that would ultimately take their first tentative steps in his book before coming to life on Requiem. Ghetto Halo: In the middle of 2009, we started working on the real design of Halo 4 and the not inconsiderable task of staffing it. Our rapidly growing team was crammed in a really small section of this building in Redmond Town Center (a mall). We were sitting two to three people in closet-sized offices meant for one, or camping out on the couch in the hallway. When people came onboard or interviewed, we would routinely get the comment, “Wow, really, this is Halo? I would think you guys would work in a better space than this.” We pretended like we wanted it to be that way – so uncool that it was cool, but in reality we were Halo wannabes and our company knew it and treated us as such. That all changed with the unsanitary sacrifice of our office savior Kenneth Scott. Kenneth, who fell for the “this space is just temporary while our real space is under repair” line during the interview process, joined our team as the Art Director. When the reality of the bad space set in, Kenneth started doing phone interviews for potential candidates in the hallway because there were no private meeting spaces. When it got too noisy in hallway, Kenneth moved his office to the men’s bathroom instituting a do not flush policy during phone interviews. Some of our best talent was recruited from the men’s bathroom. It was my own wailing and lamentation over Kenneth’s bathroom interviews that finally got my manager to approve us moving to a new space. When we moved into a much improved space, we started working on the Halo 4 prototype. How do you prototype Halo when you’ve never even built Halo before? Halo is already a beautifully balanced sandbox and we wanted to add more toys – and maybe some more sand. As a new team, we were in an awkward and unfortunate situation in that not only did we need to prototype how to take Halo forward; we needed to figure out how to build Halo in the first place. Halo? In 2010 we started working on what we call “vertical slice” which is really just a representative section of how we imagine the final game will look, feel and play. Going through that prototype process, we made the obvious decision that before we could add new things to the Halo recipe, we first needed to fully understand the existing ingredients. Could we make a level that feels and plays like Halo? Could this team build Halo? Typically with a vertical slice, you’re supposed to showcase the graphical art bar as well as a segment of gameplay. Our artists were working on a lot of art, but in 2010, David Berger and the development team were in the beginning of overhauling the engine so that in the future our artists could get their art in the game without compromising their vision. It was kind of a crazy time in the studio as we had a bunch of “wow” on paper, but really nothing in the game yet. Coming out of vertical slice, the team heard the message that it wasn’t enough. While it was in the plan to take that “wow” from paper to game, we were just getting started. Bungie wasn’t built in a day, and neither was 343. Year of the Wow: In my opinion, 2011 was our hardest year. The team might argue that 2012 was the toughest, as people put in such long days and endless weekends. But in 2012, we knew what we were building and the stress came from wondering if we would we have enough time to get everything we wanted into the game. In 2011, we knew the game we wanted to build, but the “wow” and the magic was slow in coming together. Josh and the team had their design work cut out for them. In 2011, the focus was sandbox. As you know, Halo has had (mostly) the same enemies in the sandbox for the last 10 years. For Halo 4, we had new enemies, new weapons, and new vehicles all ready to go into the sandbox. But as you also know, Halo’s sandbox is delicately balanced, so adding new stuff while ensuring it’s fun and properly thought-out, is easier said than done. For the first part of 2011 the fun wasn’t coming together. Then one magical day, I think it was sunny (a statistical anomaly in Seattle), Josh wandered over to me with a gleam in his eye – and explained that he’d just got done playing for a few hours and it was fun, it was really fun, and he thought we had it. And so it happened. Over the next few months the game started to come together. Daily playtests went from Chris and the producer team begging for players to people vying for an empty seat every day at 4:00. There is never a specific date when you exit preproduction as different areas move out of preproduction early and others later. But in Fall of 2011, every part was out of preproduction and into full production. We could play through the entire game, and for the most part it was fun. We had one mission, Dawn, where Kenneth, Neill and the art team had set their visual target and polished it to a glittering finish, and it was beautiful. The multiplayer maps were fun, the new modes were fun. Spartan Ops was starting to come together. In Fall of 2011, we could see the light even after we recovered from our exit from preproduction party. Year of the Dragon: 2012 was a very long work week that never ended. In January of 2012 we had all of the pieces of the game in some form of done or undone, and all that was left was the long hours to put all of the pieces together and polish the game to perfection. Or as close to it as time and physics permitted. From February on, there would be something new to look at or play every week. The cinematics team started dropping in all of their work and the story came to life. Every time you played the game it was new, different and better. It was a pretty amazing time to be part of 343, part of Halo 4. Everyone on the team worked incredibly long hours – basically for the entire year of 2012. Phil Spencer, the VP of Microsoft Studios told me our building smelled like human. Good human, I’m sure. In one of the take-home tests where we were supposed to play Campaign Co-op, I played the first three missions with business guy Matt. Matt wanted to explore and ensure we looked at every inch of the first three missions. It took us hours and hours to trek through three missions playing Co-op on Normal. I’ve explored every rock, plant, structure, vehicle, and vista in the first three missions. At one point in Requiem, Matt called for me to come over and look at this amazing view (literally a Sparth concept piece brought to life), and as we stood together looking over the edge, I had flashbacks of childhood family vacation pictures at the Grand Canyon – it was that awe-inspiringly beautiful. Of course, the Grand Canyon isn’t filled with inverted megastructures made of massy hardlight, but you get the idea. In between vista viewings, we also shot a few things. Last week before we hit gold, I was playing a Spartan Ops take-home on Legendary (so not a Legendary player, for the record). I got in a mission with Tajeen, Kiki, and artist Chris. In between expletives from getting annihilated by another pack of alien scum bearing Fuel Rod Canons, I found myself laughing giddily, waiting to respawn into some impossible new situation to “help” my team. It was fun, it was invigorating, and you could almost see the gold through the plasma mortars. I started this journey with huge passion for Halo, and that hasn’t changed. I ended this journey with huge passion and respect for 343 and our people. Halo 4 is a result of the energy, blood, sweat, tears and the distinct human smell of the people at 343. At the end of the day, at the end of the year, at the end of the journey, it is about the people, the team. It has been an honor to work alongside such an amazingly talented and passionate group of people. So is this the end of the journey, or is it just the beginning? I hope it is the beginning for us at 343. I hope we did the fans proud. There is no crying in Halo, but I dare you not to by the time the credits roll. Thank you for bearing with us. Thank you for letting us try our hardest. I hope we earn it.